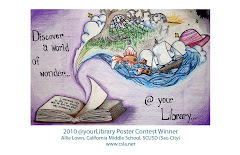 Over 100 students participated in the Ninth Annual CSLA @yourSchoolibrary Poster Contest. Pictures of kids, books, imaginary and realistic images were created using crayon, pencil, paint, and computer. What did they say? Read, Explore New Worlds, Study, Have Fun, Imagine, Get Enlightened – all @yourlibrary!